Anyone remember how they were feeling about Leinster's chances ahead of the last time we opened our European campaign at home to Wasps? Sorry to start on a bit of a downer - I know things are a lot rosier now going into this meeting - but in sport it's hard to avoid obvious parallels and this one is more obvious than most. Now I'm not talking about our reaction to the disappointing defeat, don't forget. I mean how we felt before a ball was kicked. Confidence overall was probably as low as it has been at the province for the past ten years after the Matt O'Connor years, and at the time not everyone was 100% sure about how Leo Cullen would fare in the job. However, we did have Johnny Sexton back. And for all the recent drawbacks, this was the then three-time champion Leinster at home in Europe. Whatever Wasps' credentials, it was tough not to see us as favourites, and the bookies had us as nine point winners, while I was more conservative, even more so when Isa was a late withdrawal from our lineup. Needless to say all of those predictions were shot to pieces even before the first half was over, as absolutely nothing went right for us and with the exception of an impressive win over Bath (also in our pool this time - more parallels) in round 5 with a load of youth, our entire campaign was a writeoff. Right - nobody tell the rugby gods this, but all of the above was meant to be superstitious cover for all the positivity surrounding the strength of this particular matchday 23. That can be just our little secret, ok? Seriously though, what a lineup. Proven strength at absolutely every starting position, plenty of evidence from the past six weeks that whatever XV is on the park they can work well together, and buckets of beef on the bench to back it up. I mean...you look over that fifteen and you might actually miss the fact that Rhys Ruddock's name isn't there! 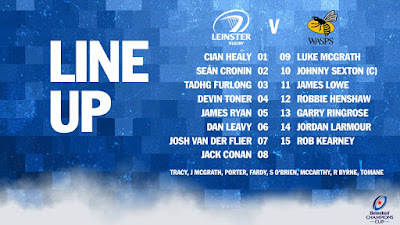 Though I have to say I do like the notion of both van der Flier and Leavy starting together; it reminds me of how the Wallabies handled their Hooper/Pocock dilemma and both young Leinster lads have hit the ground running since return from injury. And at number 8 I mooted in my Leinster v Munster writeup that perhaps Conan was a better starting option, and with Seanie ready to spring from the bench I reckon we have close to the perfect combination. But for this particular preview I reckon it's more important to have a gander at our opposition. I've had a couple of looks at them in the Premiership this season and while there are a good few new names in their ranks since the last time we played them, there are none I have seen that appear to be anything of a downgrade. One that caught my eye was centre Michael Le Bourgois. His CV says he was born in Jersey, played for the local Reds side in the Championship before ironically switching to the Bedford Blues, yet now here he is wearing 12 against the reigning champions. I'm assuming Dai Young's plans going into the campaign were to have Jimmy Gopperth in that position but his long-term injury gave Le Bourgeois the opportunity to find his feet at this level and I for one was impressed. Let's just say that for all of our title-winning solidity at 10/12/13, with All Black Lima Sopoaga and South African Juan de Jongh also opposite, we'll have little room for error tonight as they can definitely punish. Winger Josh Bassett and Springbok Willie Le Roux have been known to finish the odd try or three on occasion too, so not having Christian Wade may not be that much of a loss. But just so we're clear, I haven't forgotten that we have a couple of starting wingers who can put on a show too! And speaking of punishing, let's not forget the boot of Wasps' skipper tonight Elliot Daly. As I write, the last of Storm Callum is working its way through Dublin and by all accounts things will be much calmer this evening which means pretty much any hint of a penalty conceded even up to 10m in their half could become three points. It's in the forwards where I reckon we can get a stranglehold tonight. That's not to say our visitors won't have any pack threats, but they will definitely be missing Nathan Hughes and if we keep a tight reign on our set pieces it's going to make things very difficult for them to get any traction. Right, let's look at predictions. I remember being shocked at the bookies' 9-point spread in 2015, but all things considered I suppose this year's stretch to a 17-point winning margin is to be expected. Yet my instincts to rein in that optimism are every bit as strong. Bounce of a ball, rare missed tackle, questionable call from Monsieur Poite...I'm leaning towards some kind of curveball coming at us tonight, not to keep us from finishing on top, but possibly from getting too far ahead by the end. I say Leinster by 10-12 with a try bonus on the cards. And if you can make it to D4 a bit earlier this evening, why not head along to Energia Park (formerly Donnybrook Stadium) where at 5 bells Leinster A kick off their last pool match in the Celtic Cup against their Munster counterparts...the way the competition has shaped up, it's virtually a semifinal and as you can see below, despite our selection for the main event it's still a strong-looking squad with plenty of promising youth and battle-hardened experience on show. Replacements 16 Tom Cruse 17 Ben Harris 18 Will Stuart 19 Kearnan Myall 20 Ashley Johnson 21 Craig Hampson 22 Billy Searle 23 Rob Miller.